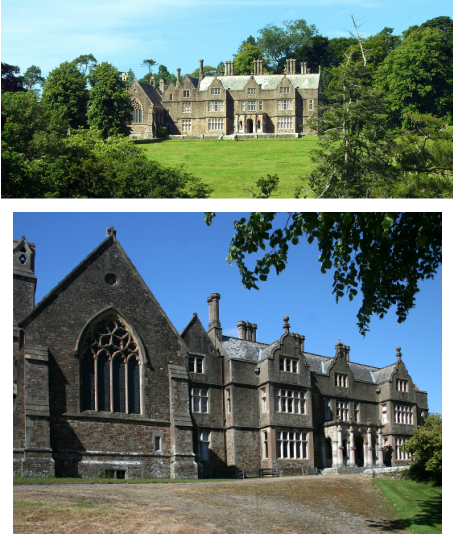 ​Hall country estate is located in the heart of North Devon. For several centuries Hall was the seat of the prominent and ancient North Devon Chichester family and continues today to be owned an occupied by descendants, via a female line, of the Chichester family. Hall mansion house is situated in Bishop's Tawton, 4 miles south east of Barnstaple on a south facing slope with splendid views overlooking the River Taw and surrounded by about 2,500 acres of land. The present Grade II listed neo-Jacobean house, which replaced an earlier building, was built between 1844 and 1847 for Robert Chichester by Philip C.Hardwick. Described by English Heritage as ' a house of real historical and unexpected architectural interest', Hall offers a series of grand reception and family rooms with an imposing staircase hall which forms the centre of the house. At the far end of the building lies a grand Gothic Hall with oak tie-beam roof , stencilled windows, stained glass and a minstrels' gallery. Outside there are various estate buildings including a medieval barn and a 17th century stable block. ​Nearby is Herner Church, a private chapel belonging to the Chichester family and dating to the 1880's. Hall, which is registered with the Historic Houses Association, is available as a wedding and events venue and a B & B with a difference.